The order Afrosoricida (a Latin-Greek compound name which means "looking like African shrews") contains the golden moles of southern Africa and the tenrecs of Madagascar and Africa. These two families of small mammals have traditionally been considered to be a part of the order Insectivora, a wastebasket taxon, and were later included in Lipotyphla after Insectivora was abandoned, before Lipotyphla was also found to be polyphyletic. 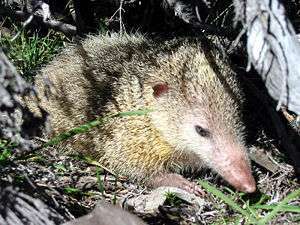 Some biologists use Tenrecomorpha as the name for the tenrec-golden mole clade, but Gary Bronner and Paulina Jenkins argue that Afrosoricida is more appropriate, despite their misgivings about the similarity between the name "Afrosoricida" and the unrelated shrew subgenus Afrosorex. Traditionally, these two families were grouped with the hedgehogs, shrews and moles in the Lipotyphla. However, there have always been minority opinions suggesting that Tenrecomorpha, or at least the golden moles, are not true lipotyphlans. These opinions are now supported by many genetic studies indicating an association between Tenrecomorpha and various other African mammals in the superorder Afrotheria; however there is no strong morphological evidence to link the Afrosoricida together with other afrotherians. Afrosoricids are sometimes considered part of the Afroinsectiphilia, a clade within Afrotheria. As a rule, tenrecs tend to be small animals varying from 4 cm to 39 cm in length. There is no pronounced body type since they have evolved to take over the insect-eating niche in Madagascar. However, based on the niche occupied, they look like shrews, hedgehogs or otters. Their coat can vary from smooth to spiny and the coloration of the fur is generally dirt brown. Most species are also nocturnal and have poor eyesight. However, their whiskers are rather sensitive and they can detect very minute vibrations in the ground to locate their prey. 1 2 Bronner, G.N. ; Jenkins, P.D. (2005). "Order Afrosoricida". In Wilson, D.E. ; Reeder, D.M. Mammal Species of the World: A Taxonomic and Geographic Reference (3rd ed.). Johns Hopkins University Press. pp. 71–81. ISBN 978-0-8018-8221-0. OCLC 62265494.